Annabelle: Creation entertains rising star Lulu Wilson who was a breakout in last year’s Ouija: Origin of Evil. The Annabelle films and Ouija films have more in common than just being current horror films. Even worse than the first Annabelle (29% on RT), Ouija was a colossal disaster (7% on RT). Universal and Blumhouse then made the ingenious decision to actually give its sequel a zealous and abled director; Mike Flannagan whose previous films were the hits Hush and Oculus. The result, Ouija: Origin of Evil, was a renewed and fresh addition that was a vast improvement over its predecessor (82% on RT). New Line Cinema and Warner Bros. followed suit and, following the underwhelming first film in The Conjuring spin-off franchise, brought in a proven director, David F. Sandberg (Lights Out) to helm the sequel. While the move was a success in the Ouija example, it was a triumphant achievement for Annabelle. Annabelle: Creation is a horrifying film that shows the passion of the filmmaker; the flick contains old-fashion terror with a modern take which puts it against movies like Insidious, Sinister, Get Out, Paranormal Activity, and The Conjuring as one of the most-effective contemporary horror films. Annabelle: Creation tells the story of a small group of orphans run by Sister Charlotte (Stephanie Sigman) who’re taken in by a morose husband (Anthony LaPaglia). After two of the younger girls, Linda (Lulu Wilson) and Janice (Talitha Bateman), find a seemingly haunted doll they soon realize the danger they’re in. The acting is surprisingly efficient, despite such a young cast; the two leads are able to invoke humour and thrills commendably. The 50’s setting only gives more credibility to the girls’ innocent and naïve nature. Characters are constantly making cliché horror decisions, but none of which feel unnatural for themselves. A sick and mysterious wife, a caring nun, the cruel older girls, and a stern and secretive caretaker are rampant, though treated with a realness and credibility that allow the audience to enjoy and embrace their presence. The film does have a few flaws; the resolution doesn’t exactly stick the landing (plus also deals with the first film, ugh), the reasoning for the possessed doll isn’t totally original, and the script may come off as a bit trite at times. Though the faults are meekly apparent, they’re easily forgivable since the more significant properties of a horror film shine extremely bright. Practical effects are mostly the law of the land with only a few CGI shots. You never once see the doll move, but what they’re able to achieve with it is far more terrifying. Jump-scares, situational horror, and an eerie all around feel make the film one of the scariest I’ve experienced in a theatre. Without giving away the specific scares, they’re plentiful and almost too much so. The film feels unrelenting; constantly I yearned a scene would be over because my heart rate couldn’t afford to climb any higher. 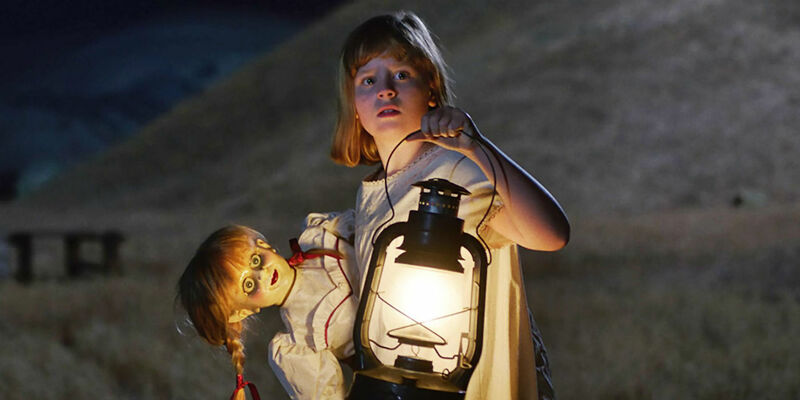 The goal of any horror film is to scare, and though some such as Cabin in the Woods or The Exorcist can do more than just that, Annabelle: Creation is the apex when it comes to inducing fear. The film doesn’t reinvent the wheel; it’s full of horror tropes but executes each of them with a flawlessness that’s wholly dazzling. It’s incredible how a film can feel so familiar and nostalgic yet fresh and original all at the same time. Much like his directorial debut, Sandberg doesn’t rely on violence or disturbing visuals to interrupt the comfort of the audience. The ‘R’ rating is established, but with almost no violence, no language, and no sexuality. Much like the first two Conjuring films, the rating comes from its overall ability to invoke such dread that it’s not suitable for children; a dread that was audibly noticeable by the whole audience in my theatre. So far, in the history of Cinema 35, only four films have gotten a rating of nine out of ten or higher (It Comes at Night, Baby Driver, and Spider-Man: Homecoming) and as bizarre as it seems, this film is just as deserved to be in the company of those. It feels consequently unpretentious to be so infatuated with a sequel to a horrendous misfire, but I can’t deny my satisfaction with Annabelle: Creation’s final result. Horror films always come in waves, and if we continue to see passionate and wickedly brilliant scary movies like this one, then I welcome it with opened arms (but all the lights on and doors locked).